This past spring, the kid's Auntie M presented Lobo with a pumpkin costume. Halloween was months away, but we put the costume on him. Total. Cuteness. Overload. She also had a lobster costume. It was a tad bit too small, however, with a few alterations, I could make it work. Altering the lobster costume is still on my to-do list. With the Autumn season officially here, Mommy Lobo wanted to sport his pumpkin costume. This year will mark his first Halloween with us and, quite possibly, his first Halloween celebration ever. This time last year he was living in horrid conditions. Lobo isn't bothered by apparel. For the first 5 months as a member of our family, he had to wear a shirt. There was a patch on his back (a deep scar) that remained bald after his fur had all grown back. That area was sensitive to the elements. Miraculously, peach fuzz eventually grew. Then fur. Thick fur. He no longer has to wear shirts. 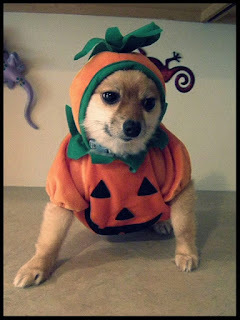 Once I put Lobo in his pumpkin costume, he was ready for a mini impromptu photo session. I didn't have any props ready. I probably should have put something down on the counter as he tends to lose footing easily. However, Lisa was there to assist. Hold up a biscuit. Bribery at its finest. I needed a quick photo. After about 25 photos, he was done. His favorite toy was on the floor along with assortment of preferred chew bones. He was tired. While the I didn't get the greatest of photos, I managed to capture this one. It appears that he's annoyed. The look on his face says, "Mom, are you done yet? I'm so overrrr this costume." Truth be told, neither one is the case. What really happened was, in the process of trying to get Lobo to look at the camera, he became fixated with a biscuit Lisa was holding in her hand. This is one of the many reasons why I adore those imperfect photos. The ones you don't intend on capturing.